We are a small family-operated farm located in the Ozark hills of Missouri. 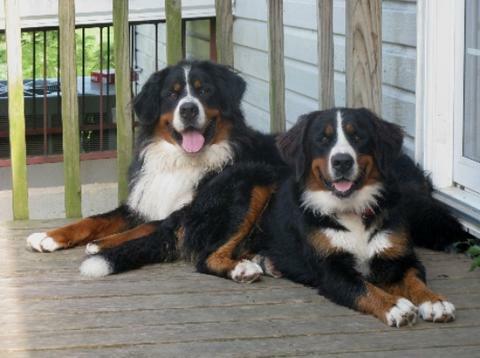 Bernese Mountain Dogs (Berners) have been a part of our lives for more than fifteen years. Our 70 acres where our dogs get there daily run (and cooling off at the pond) is also home to cattle, horses, donkeys, chickens, rabbits, and more. From day one our puppies receive lots of socialization and TLC from our children. All puppies have declaws removed, vet checks, current shots, and deworming. Parents are OFA certified with excellent ratings. To raise healthy, well-socialized, well-bred dogs for companian animals is our goal. Puppies are sold with written contract and health guarantee. We welcome visitors to stop by and see our newest babies or call us at (417) 935-2597 or (417) 880-3484 for questions.